-and our latest restoration project: a fancy 1890s German dollhouse pastry shop...sneak peek below! I've accumulated a lot of vintage space toys lately, and was looking for a new way to display them that wouldn't take up so much room. I also had an old gumball machine that I'd been trying to find a use for, and one day, as I looked at it, I thought it might actually make an interesting sort of display case. It had a prominent metal mechanism in the center, which originally turned to push the toy capsules out when a quarter was inserted, and it also had a wire arch that spanned the front window, used to hold the machine's original advertising card in place. They had a machiney, space-agey, electrical look to them, like props from the set of Metropolis, I thought...so I installed some 1950s children's space print fabric as a backdrop, then arranged a scene using vintage Archer Space Men and robots, along with some 1950s space-themed dexterity puzzles. At a weekend toy show recently, I found a whole heap of...well, very odd things. These little plastic characters, between 1 and 1 1/2 inches tall, were cereal premiums (and sometimes Cracker Jack prizes) made in the late 1960s and 1970s by an Australian company called R & L. The tiny toys were found in packages of Kellogg's cereal worldwide, although there were some country exclusives. In the late '70s, the company was sold and the owners moved the plant to Mexico, where production continued in a range of new, brighter colors. There were many different sets of odd and imaginative characters produced by R & L, often with spacey, alien themes, and each with individual names. Fanatical collectors strive to get them all, sometimes in every color combination possible. These, the Crater Critters, are some of my favorites. The original cereal box promotion read: "Here are the cutest creatures you have ever collected -- Kellogg's 'Crater Critters." Normally they live way down in the deepest craters on a far off planet. They are shy little people, that's why we hardly ever see them." Click here to see an original cereal box ad for the Crater Critters. Next are the AstroNits: "Round and round they go in lunar orbit, in their rockets and flying saucers, the mad, crazy Kellogg's 'Astro-Nits.' With retro rockets firing they zoom into Earth orbit to land on your breakfast table. So you can recognize them we have stamped a dotty name on every one of them." Some of the AstroNits shown below include Knot-Nit, Clown-Nit, Goof-Nit, and Yak-Nit. Then there are the Funny Fringes: "Way out fun creatures from a make-believe land on the fringe of outer space." They all have names ending in "inge." Collecting R & L premiums can be both a lot of fun (finding figures in cases full of unrelated items at shows) and a lot of frustration (trying to get that elusive last Crater Critter to complete your set), but regardless, they bring a smile to my face every time I look at them. Collector Mike Speth has written a great guide to these toys, "Collecting Crazy Colored Plastic Weird-Things," that appeared in issue #12 of Freakie Magnet, a cereal collector's zine. It can also be read online, and is chock-full of photos and helpful info. The company history, figure identifications, cereal box quotations, and original ad linked above were all found at his site. Go check it out! When I was a kid back in the 1970s, one of my favorite toys was actually one of my smallest and cheapest: a set of tiny, 1 inch tall plastic robots that came from a gumball machine, or possibly from the "cheap toy aisle" at the grocery store, I can't really remember. They were just the right size to carry around, and they went everywhere with me. My two little brothers loved the robots too, and even though we all played with them and toted them about, we still have them today. Shown twice as large as actual size! I've always been on the lookout for more of these wonderful little robot guys, but had never seen any until we discovered some at a recent toy show. Oddly, these are red, although they're clearly from the same molds, and they have exactly the same stamping on the bottom ("H.K." for Hong Kong.) The dealer and I were both really excited to find each other, as we'd both been looking for more information on these guys for the last 20 years, but were both disappointed to discover neither of us knew anything about them. Does anyone out there recognize these robots??? I found this fantastic 1952 space themed card game, "Space Race," at a toy show last weekend, and was blown away by its graphics. The deck features classic mid-century space exploration illustrations, including sleek rocket ships, clean-cut space men, and outrageous space monsters. At a toy show last weekend, I found a wonderful, very tiny set of antique porcelain German dollhouse dishes tucked away in an old candy box, buried in a pile of junque under a dealer's table. Price: just $10.00! The set, circa the early 1900s, includes a tureen, vegetable dish, gravy boat, cream pitcher, plates, and a serving tray. For a sense of scale, the itty bitty tureen is just 1 1/2 inches long. One of the dealers at a toy show I went to last weekend had tables full of "grab bags" she had made, each priced at just $5.00. Each bag, a large ziploc type, was filled with an assortment of small toys of varying age and quality. Mostly junk, yes, as is often the case with grab bags, but occasionally harboring a treasure, as is sometimes the case with grab bags, making them always worth a good look. In one, amongst the single doll shoes, broken barrettes, and unknown action figures missing an arm, was this tiny, 1 1/2 inch pencil top troll, made by Scandia House in the mid-1960s. She still has her original outfit (possibly a clown costume) unusual purple eyes, and her blue mohair. A hard-to-find and pricey troll! -2 German dollhouse tables, circa the 1920s, priced at only $5.00 each! -a tiny set of German porcelain dollhouse dishes, circa the late 1900s, with a tureen, gravy boat, cream pictcher, vegetable dish, plates, and tray, found in an old candy box beneath a pile of junk, priced at just $10.00! - a little Scandia House pencil top troll from the 1960s, 1 1/2 inches tall, still in her original outfit, spotted in a grab bag of (mostly) junk, for just $5.00, too! -a huge lot of R & L cereal premium figures from the 1960s-70s: Astro-Nits, Funny Fringes, Toolie Birds, Crater Critters, etc. Pics to come later this week! with a typical two-room interior. It still has all of its original wall and floor papers. The French-made metal furniture, dating from the 1920s, is in a small, mostly 1/2 inch scale, and includes a table, chair, bench, dressing table with gilt mirror, sewing machine, and two twin beds. The German tin fireplace, from the late 1900s-early '20s, still has its red foil "fire." A Cracker Jack prize clock rests on the mantle. The beautiful baby carriage, another of the French penny toy pieces, holds a Frozen Charlotte doll. 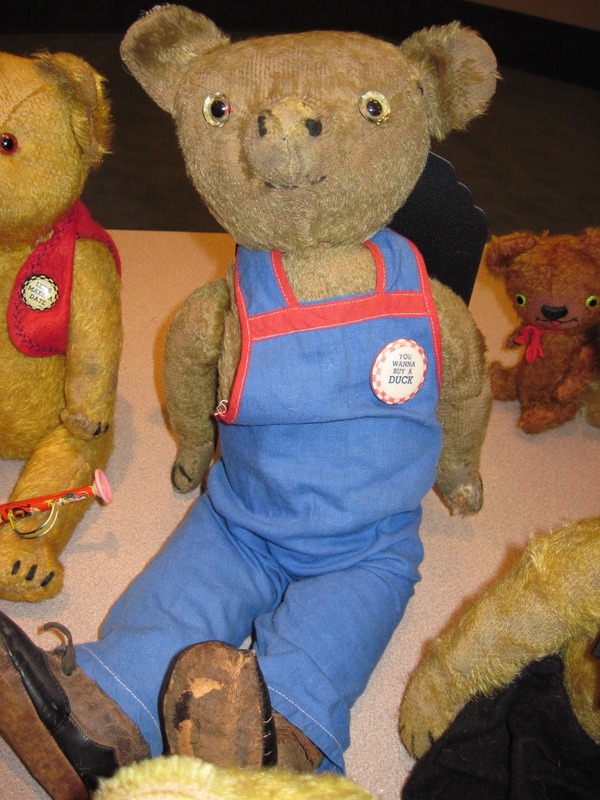 A 1907 Laughing Roosevelt Bear, made by the Columbia Teddy Bear Company of Brooklyn, New York. His mouth opens, emulating Roosevelt's trademark toothy grin! Also from the 1920s, these miniature bears made by Schuco of Germany hold many surprises. The largest, in the back, is actually a perfume bottle: his head lifts off to reveal a glass vial. The pink bear on the right houses a compact in her torso, complete with a tiny puff and traces of powder, while her head lifts off to reveal a lipstick tube. The crazy looking bear on the left is Schuco's famous two-faced Janus bear: his head can be turned completely around, where a different face can be found. The tiny bear in front is Schuco's smallest variety, the Piccolo, just 2 inches tall, with his original felt paws and feet. These two twin British bears date from around WWI. They belonged to twin brothers who emigrated to America in the 1920s, and were clearly much loved. In fact, the different wear patterns on each bear show how the boys played with and used them. The bear on the left has a completely bare, broken down arm, from being regularly carried by that paw, but his torso stuffing is intact and sturdy, indicating he wasn't slept on nightly and thus squashed flat, like his brother on the right.